We believe that our DVD Video Slide Show is the finest offering available from anyone in the film scanning industry. 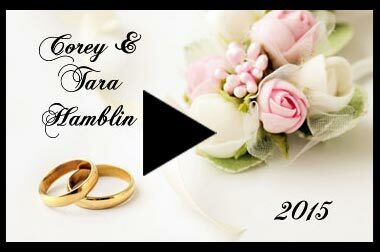 We have devoted thousands of hours in research and programming to develop a fully customized wedding video slideshow product. 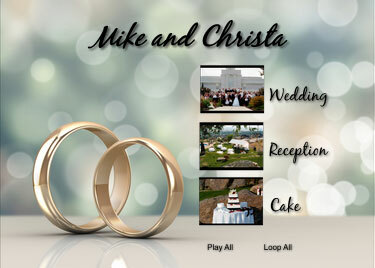 Customize your video by including your own music choice for your Wedding DVD Video Slideshow. Includes up to 50 images. Up to 3 Jump Points/Title Slides, Custom Menu, Title, Font, and Music. Includes up to 100 images. Up to 4 Jump Points/Title Slides, Custom Menu, Title, Font, and Music. Includes up to 150 images. Up to 6 Jump Points/Title Slides, Custom Menu, Title, Font, and Music. A Jump Point is a "Chapter" in your video. If you choose to have jump points we will create them based on the names you give each of your groups. 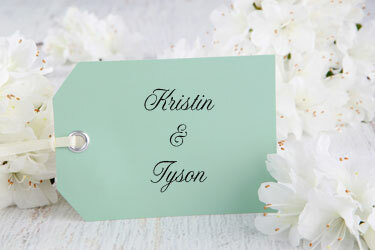 If you have a title for your entire project let us know in your special instructions, and we will add it to your menu page. Customers choose things such as "Smith Family Memories" or "The Life of John Doe." Below is an image of what a menu looks like. It comes up before you hit play on your slideshow. 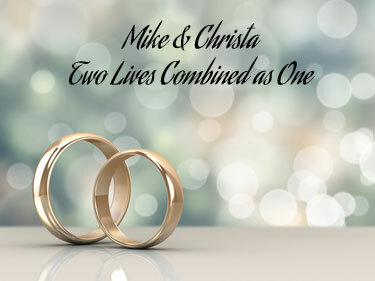 "Mike and Christa" is the TITLE. 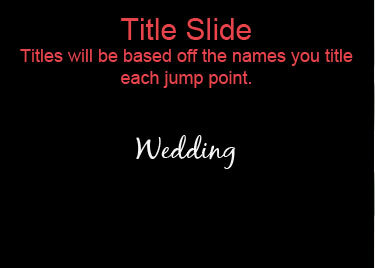 "Wedding, Reception, and Cake" are all examples of JUMP POINTS. 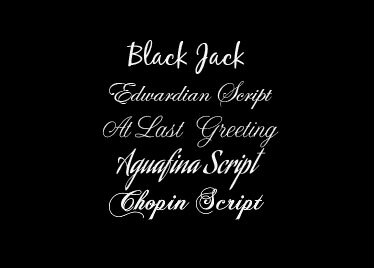 We have a couple different fonts below for you to choose from. The title slide and menu above used Black Jack. The title slides in the actual slideshow used Edwardian Script. 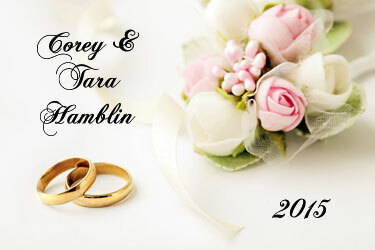 We have a couple different menu's you can choose from or we can use a picture you choose from your wedding. We recommend sending in music that you have legally obtained that fits the personality of the bride and groom or means something to you as a couple. Instrumental music works beautifully for a wedding video as well. Unless you request otherwise, each image in your slides will be on screen for 3 seconds, with a 1-second fade-in & 1-second fade-out transition between them, totaling 7 seconds of screen time per image. 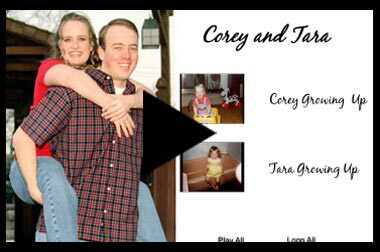 You will want to provide approximately 7 seconds of music per image for each chapter on your slideshow. Songs will need to begin & end in the same chapter. We can sync your slideshow to the duration of your music so that it will end in sync with the song, but you will want to get close to 7 seconds per image. Once you have selected the music you want to use, you will want to tell us in the special instructions section on your order form or include a separate piece of paper with all of your instructions.